The story for this pasta recipe is simple... I love the movie Hocus Pocus!!! Around Halloween time, who doesn't?! I have watched that movie every October since 1993 when it was released! 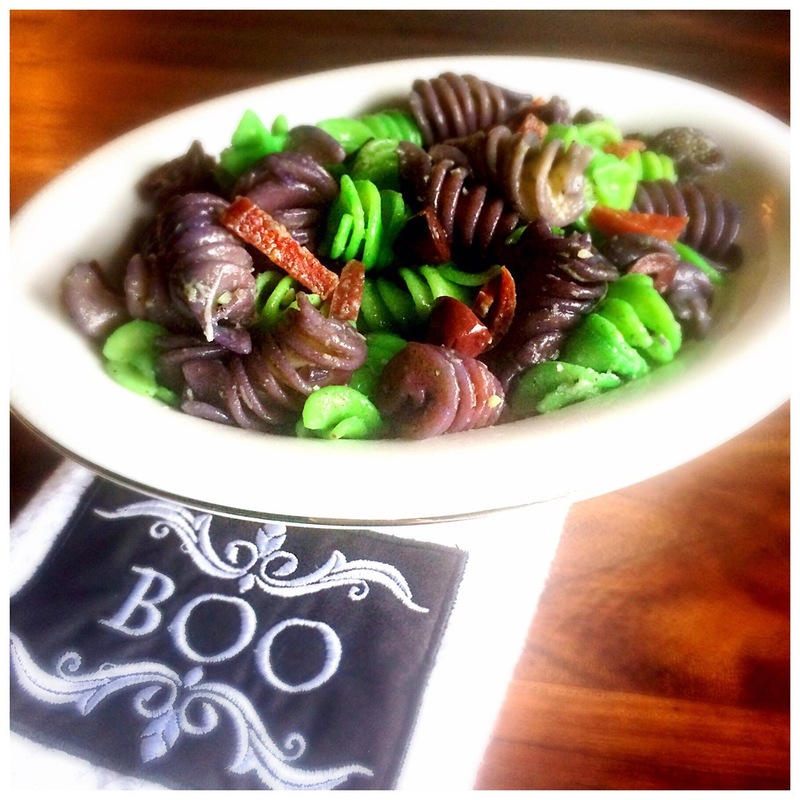 This recipe is perfect for a movie night, a get together with "witches," or a Halloween party! 1. Bring a large pot of salted water to a boil. Add the pasta and cook according to the directions on the box. It should be tender but still firm when ready. In one large ziplock bag, add the green food coloring. In another large ziplock bag add the red and blue food coloring, creating purple. 2. Drain pasta, reserving at least 1/4 cup of pasta water. Put half the pasta in the ziplock bag with green coloring and the other half in the bag with purple coloring. Add 1 to 2 tablespoons of pasta water to each bag. Close and move around, coating all the pasta with the color. Let sit for 5-10 minutes, then rinse each pasta color separately. 3. Combine the green and purple pasta in a large bowl. In a small bowl, whisk together the garlic, red wine vinegar, olive oil, 1 tsp salt, and 1/2 tsp of pepper. Pour over the pasta and toss together. Add the olives, pepperonis, Parmesan cheese and toss one last time. Taste and add more salt if needed.